A couple of weeks ago, BBC Radio 4s Gardeners’ Question Time mentioned that Roman soldiers introduced Roman nettle to Britain. They used it to keep themselves warm by beating themselves with the stinging plants. As someone who studies Roman plant remains, this is a pretty amusing picture. But I was also a bit confused why I had never come across this in any of the archaeological material I read during my research. First things first, what is Urtica pilulifera? A quick flick through Clive Staces’ New flora of the British Isles (1997) shows Roman nettle used to occur as a casual in southern Britain, but does not occur any more. Next stop, the Online Atlas of the British Flora. No mention of Roman nettle, neither is there in Preston et al’s 2004 article on archaeophytes in Britain. Flora Europaea does tell us Roman nettle is an annual growing 30-100cm, monoecious, with 2-7cm leaves and flowers in globose heads. It now grows in southern Europe, but used to be found further north but is now rare. Is this earlier distribution due to the expansion of the Roman Empire? The wikipedia page for Roman Britain has a brief section on environmental changes, in which it reiterates that roman soldiers introduced Roman nettle to warm themselves. Sadly, all of the fascinating plant foods that were introduced in the Roman period are missing (note:archaeobotanists should spend more time editing wikipedia). The article references a 1949 paper by Homer Nearing, published in the (paywalled) journal of the Medieval Academy of America. In this article Homer writes about the various medieval legends relating to Julius Caesar. Homer discusses how the nettle story was described by William Camden as originating with John Parkinson, the Elizabethan herbalist. In his historical survey of Great Britain, (Britannia 1586), Camden describes how Parkinson linked Urtica romana with Romney, Kent by arguing that Julius Caesar landed there in 54 BC. The Roman soldiers apparently bought seeds with them to sow, so they could use the plants to keep warm. Camden disagrees with Parkinson on 2 points. Firstly, Roman nettle grew in several coastal locations in the late 16th century, and not just Romney. Secondly, Caesar didn’t land in Romney, so the story can’t be true. If Camden knew that the story was false over 400 years ago, how is it still accepted? The association of stinging nettles with soldiers appears on various websites concerned with folk lore and natural remedies. Some websites associate the claim with William Camden, and miss off the bit where Camden disagrees with it. Here’s a good example. The association of Roman nettles with Roman soldiers also makes it way into medical journals, appearing in Randall et al’s 2000 paper on using nettle for pain relief. In turn, they reference Richard Mabey’s Flora Britannica, which attributes the link between Roman soldiers and Roman nettle back to Camden (Mabey 1996, p. 68). 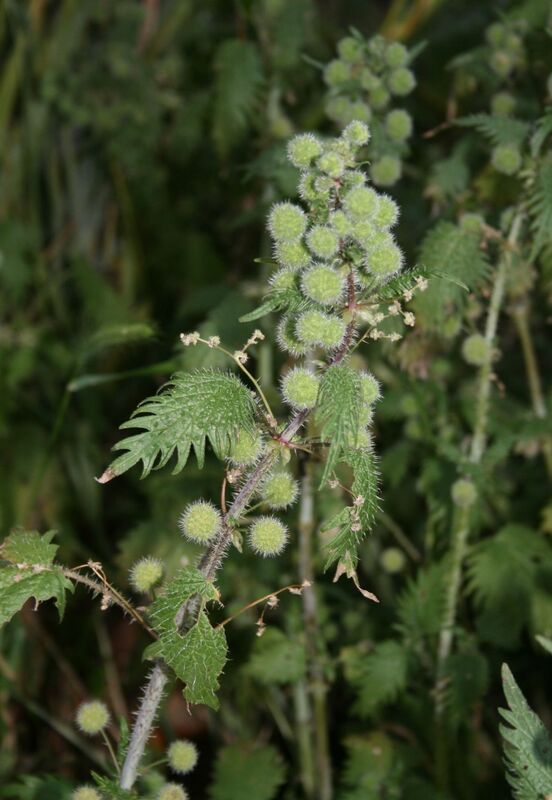 There are currently no records of Urtica pilulifera listed on the Archaeobotanical Computer Database for Britain. Considering the hundreds of Urtica dioica – stinging nettle and Urtica urens – common nettle seeds that archaeobotanists find from archaeological settlements, the absence of Roman nettle must mean it was never introduced here. Nettles are interesting for their use in Roman medicine, and Urtica urens (small nettle) was introduced to Britain in the Late Bronze Age (Preston et al. 2004). But the introduction of Roman nettle to Britain by roman soldiers is only a popular folk story. Homer Nearing Jr 1949. Local Caesar Traditions in Britain. Speculum 24(2):218-227. Mabey, R. 1996. Flora Britannica. London: Sinclair-Stevenson. Preston, C., Pearman, D., & Hall, A. 2004. Archaeophytes in Britain. Botanical Journal of the Linnean Society 145:257–294. Randall, C., Randall, H., Dobbs, F., Hutton, C., & Sanders, H. (2000). Randomized controlled trial of nettle sting for treatment of base-of-thumb pain. Journal of the Royal Society of Medicine, 93, 305–9. Stace, C. 1997. New flora of the British Isles. Cambridge: Cambridge University Press.